Ohio State University planetary scientists have found the remains of ancient lunar impacts that may have helped create the surface feature commonly called the "man in the moon." Their study suggests that a large object hit the far side of the moon and sent a shock wave through the moon's core and all the way to the Earth-facing side. The crust recoiled -- and the moon bears the scars from that encounter even today. The finding holds implications for lunar prospecting, and may solve a mystery about how past impacts on Earth affect it's geology today. The early Apollo missions revealed that the moon isn't perfectly spherical. Its surface is warped in two spots; an earth-facing bulge on the near side is complemented by a large depression on the Moon's far side. Scientists have long wondered whether these surface features were caused by Earth's gravity tugging on the moon early in its existence, when its surface was still molten and malleable. According to Laramie Potts and Ralph von Frese, a postdoctoral researcher and professor of geological sciences respectively at Ohio State , these features are instead remnants from ancient impacts. Potts and von Frese came to this conclusion after they used gravity fluctuations measured by NASA's Clementine and Lunar Prospector satellites to map the moon's interior. They reported the results in a recent issue of the journal Physics of the Earth and Planetary Interiors. They expected to see defects beneath the moon's crust that corresponded to craters on the surface. Old impacts, they thought, would have left marks only down to the mantle, the thick rocky layer between the moon's metallic core and its thin outer crust. And that's exactly what they saw, at first. Potts pointed to a cross-sectional image of the moon that the scientists created using the Clementine data. On the far side of the moon, the crust looks as though it was depressed and then recoiled from a giant impact, he said. Beneath the depression, the mantle dips down as he and von Frese would expect it to do if it had absorbed a shock. Evidence of the ancient catastrophe should have ended there. But some 700 miles directly below the point of impact, a piece of the mantle still juts into the moon's core today. That was surprising enough. "People don't think of impacts as things that reach all the way to the planet's core," von Frese said. But what they saw from the core all the way to the surface on the near side of the moon was even more surprising. The core bulges, as if core material was pushed in on the far side and pulled out into the mantle on the near side. Above that, an outward-facing bulge in the mantle, and above that -- on the Earth-facing side of the moon -- sits a bulge on the surface. To the Ohio State scientists, the way these features line up suggests that a large object such as an asteroid hit the far side of the moon and sent a shock wave through the core that emerged on the near side. The scientists believe that a similar, but earlier impact occurred on the near side. Potts and von Frese suspect that these events happened about four billion years ago, during a period when the moon was geologically active -- with its core and mantle still molten and magma flowing. Back then, the moon was much closer to the Earth than it is today, Potts explained, so the gravitational interactions between the two were stronger. When magma was freed from the Moon's deep interior by the impacts, Earth's gravity took hold of it and wouldn't let go. So the warped surfaces on the near and far sides of the moon and the interior features that connect them are all essentially signs of injuries that never healed. The impacts may have created conditions that led to a prominent lunar feature. The "man in the moon" is a collection of dark plains on the Earth-facing side of the moon, where magma from the moon's mantle once flowed out onto the surface and flooded lunar craters. The moon has long since cooled, von Frese explained, but the dark plains are a remnant of that early active time -- "a frozen magma ocean." How that magma made it to the surface is a mystery, but if he and Potts are right, giant impacts could have created a geologic "hot spot" on the moon – a site where magma bubbles to the surface. Some time between when the impacts occurred and when the moon solidified, some magma escaped the mantle through cracks in the crust and flooded the nearside surface and formed a lunar "hot spot". A hot spot on Earth forms the volcanoes that make the Hawaiian island chain. The Ohio State scientists wondered: could similar ancient impacts have penetrated the Earth, and caused the hot spots that exist here today? von Frese thinks that it's possible. "Surely Earth was peppered with impacts, too," he said. "Evidence of impacts here is obscured, but there are hot spots like Hawaii . Some hot spots have corresponding hot spots on the opposite side of the Earth. That could be a consequence of this effect." He and Potts are exploring the idea, by studying gravitational anomalies under the Chicxulub Crater on Mexico 's Yucatan Peninsula . A giant asteroid struck the spot some 65 million years ago, and is believed to have set off an environmental chain reaction that killed the dinosaurs. NASA funded this research. The space agency has been charged with returning astronauts to the moon to prospect for valuable gases and minerals. But even today, scientists don't entirely know what the moon is made of – not down to the core, anyway. 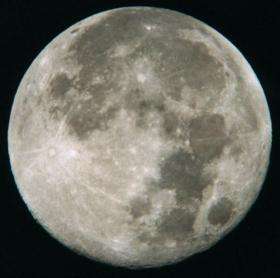 They can calculate where certain minerals should be, given the conditions they believe existed when the moon formed. But impacts like the one Potts and von Frese discovered have since shuffled materials around. Gravity measurements, they said, will play a key role as scientists figure out what materials lie within the moon, and where. "We don't fully understand the way these minerals settle out under temperature and pressure, so the exact composition of the moon is difficult to determine. We have to use gravity measurements to calculate the density of materials, and then use that information to extrapolate the likely composition," Potts said. von Frese said a lunar base would be needed before scientists can more completely answer these questions. Potts agreed. "Once we have more rock samples and soil samples, we will have a lot more to go on. Nothing is better than having a person on the ground," he said.